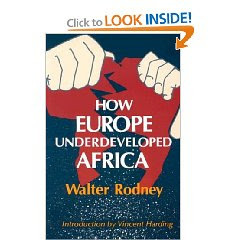 After reading "How Europe Underdeveloped Africa" by Walter Rodney, I'm feeling guilty again about the ways underdeveloped labor is exploited for our benefit. Nowhere does this happen as badly as clothing (well, and food... and toys). I have terrible pangs of conscience whenever I buy a new item of clothing now. Was the cotton genetically modified, requiring more irrigation water and chemicals to grow, and driving cotton farmers into debt-related suicide? Were the workers in the mills that turned the raw cotton into yarn exposed to terrible working conditions and underpaid? Who made the shirts - were they paid a fair wage? I just feel better recycling old shirts. Salvation Army is becoming my best friend. I feel like it doesn't count if I get it used. 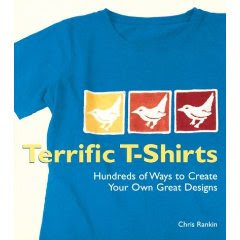 I found a great book on treating t-shirts (or any cotton clothing, really) to make it more decorative. One of the techniques is called "Discharge Dyeing". You use a bleach solution to remove color from a dark colored shirt instead of dyeing a white shirt. For the one in the picture I used a solution of 1 cup bleach to 3 cups water. If you worry about the bleach/dioxin thing you can try the RIT decoloring stuff instead. I laid the shirt out flat then spider walked my fingers to scrunch it into mountains and then used some rubber bands and cotton yarn to tie it into a tight bundle. I submerged it in the bleach solution until it got the shade I wanted then put it in a deactivating solution I had ready - 1/4 cup vinegar to 1 quart (4 cups) water. The cool thing about discharge dyeing is that you can use shirts with stains, bleach spots, whatever, and they'll look great when you're done!